- 15/20 minute scare maze! - Boss rooms that hold the devil's worst nightmares! - Set in a an abandoned shopping centre! - 2 nights only for Halloween 26th & 27th! - No time slots, turn up between 7pm and midnight! Synopsis :- " The devil doesn't want you to know what it fears, imagine the worst things that could ever be created. Welcome to his mind... Can you find the clues and escape the horror? Find out in Milton Keynes this Halloween..."
Perfect for you and a friend or a group at just £10 per person. Book online or pay on the door! They open from 7PM till 12PM at this postcode! MK9 3PY, right next to the RBS bank and the Food Court car park. After why not spend the rest of the Halloween weekend at the new 12th street entertainment district for more fun and games! 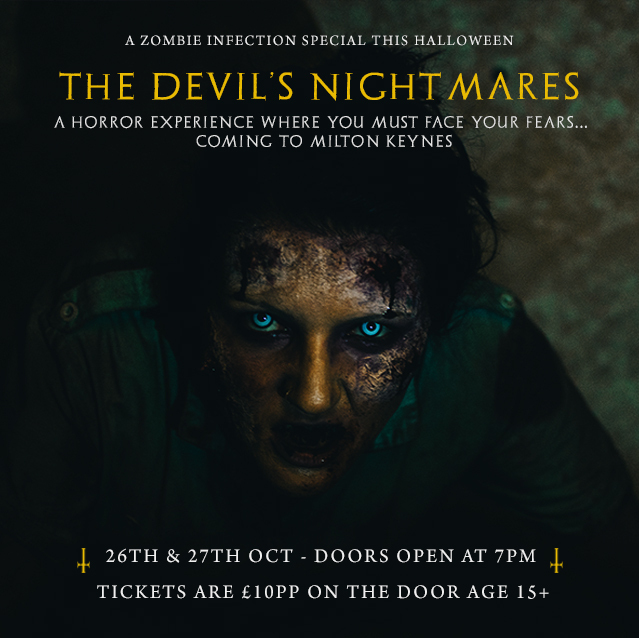 There's so much to do in Milton Keynes this Halloween! Please note this is 15+ only, guest arriving intoxicated may be refused entry. No set times for entry! No refunds!